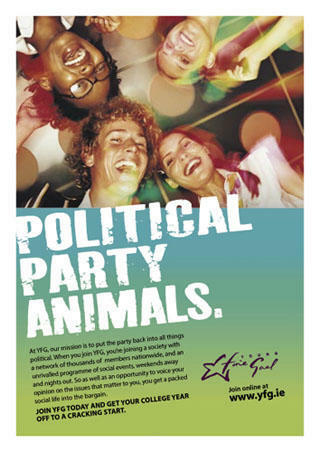 This is the new advertising campaign for Young Fine Gael. With most colleges having their societies day soon the membership drive is well under way!! UCC YFG will have a stand at Socs Day on Wednesday 28th from 9 to 5 in the Multi Functional (Devere Hall) in the Student Centre!! Come up and join us! Previous Previous post: Is the role of religion dead in today’s society?